Madison & Alistair's Wedding Day! These photos from Stephanie Brazzle Photography were too gorgeous to not warrant a second blog post! This was a fun group... can ya tell? Can we talk about this bouquet for a minute? WOW. Amazing work by Something Pretty Floral. Madison and her mother LuAnn were a JOY to work with. Not to mention, they are both absolutely beautiful women! Both wanted flawless glowing complexions, a sublte pop of color on the lips and a bit of drama on the eyes. I love how the bridesmaid dresses are color coordinated with the glass and steel surroundings of the Joule's rooftop courtyard - wow! I'm just obsessed with the clean, crisp, modern elegance of this ceremony set up by Engaged Events! Did I mention that the groom is Scottish, the newlyweds actually live in Scotland, and that they all wore kilts with their family plaid? Check out that adorable ring bearer! makeup & hair styling: Yours Truly! Madison & Alistair - Bridal Portraits and Teaser Video! Madison's wedding to Alistair was only two days ago, so you can imagine how THRILLED I was to find bridal portraits and a teaser video in my inbox this morning! Even though Madison and Alistair are now living in his home country of Scotland, they decided to have their nuptials in Madison's home town of Dallas, and I'm so glad we were able to be a part of such a special day for them. The dream team of vendors for this event included The Joule Hotel in Dallas, Engaged Events, Stephanie Brazzle Photography and Jonathan Mayfield Media. Sarah & Ethan's wedding on the My Creative Touch Blog! Sarah & Ethan's lovely garden-inspired wedding at the Omni Dallas hotel is on the My Creative Touch blog! We absolutely loved working with Sarah and creating classically elegant looks for her and her bridal party. Check out the full blog post with all the details here! Ashley & Nico's Wedding Highlights! We've already blogged about Ashley & Nico's gorgeous wedding, but we just saw the highlight video from Wiler Weddings and just had to share it! You can also read more about their story on the Springs Event Venue blog here! Announcing our newest studio location! We are so thrilled to announce the opening of our SECOND studio location to better serve our Dallas-area brides! Starting in January 2018, we will be sharing a new space with some of our wedding vendors (including Significant Events of Texas and Hampton Morrow Photography) in a collaborative space located at 17618 Davenport Rd in Dallas, TX. This location is ideally located in between Dallas and Collin Counties. We are so excited to be able to better serve our Dallas brides with this new location! The Tarnos recently blogged Brooke and Kylen's wedding! I just can't get over this stunning palette of blue and red. We loved working with one of our favorite planners, Meredith Commender of Significant Events of Texas at The Venue at Waterstone! Every once in a while a photographer sends me a gallery of portraits that are just SO gorgeous, I couldn't possibly choose only one for my bridal portfolio. This is definitely one of those times! Sara's bridals were shot at her wedding venue, The Milestone Mansion in Aubrey, TX. This lush, organic summer bouquet was designed by one of our favorite florists, Holly Viles Design. We styled Sara's hair in loose tousled waves softly pinned at the nape of her neck with loose curls framing her face. Thank you so much to Debbie Slawter for sharing these beautiful images with us! We can't wait to see the pics from the wedding day now! Erin is featured in Voyage Dallas today! Check out this article on Erin Blair Gobin, owner of Erin Blair Makeup and Hair Design, in Voyage Dallas! 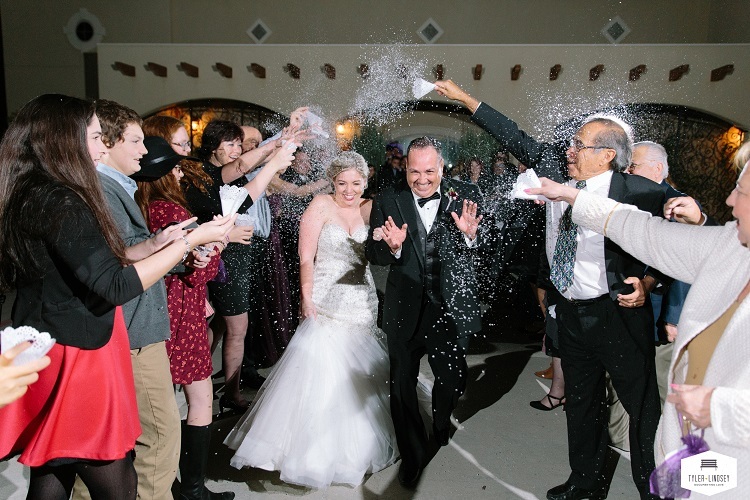 So excited to share the beautiful images from Wiler Weddings of Ashley and Nico's wedding day! Ashley's soft, tousled updo is one of my favorites to date! Paired with soft smokey eyes and a glowing complexion, Ashley's look is fresh and pretty and perfect for her rustic elegance wedding at The Springs in Aubrey, TX. 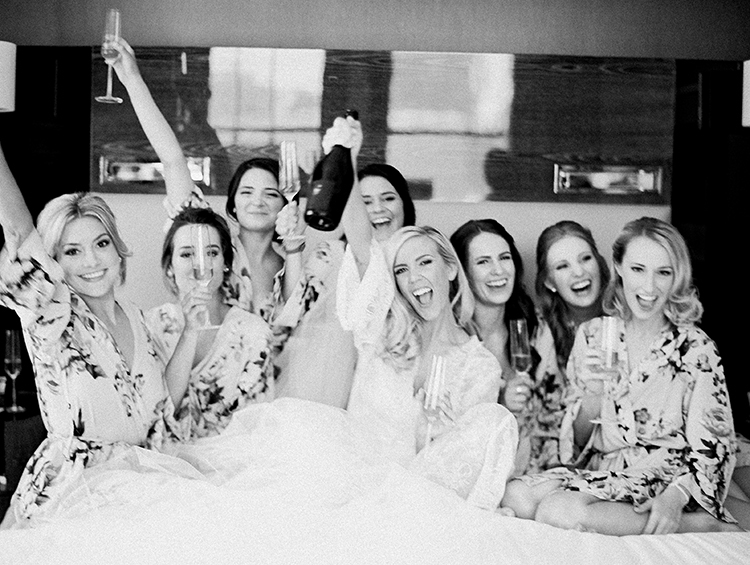 I seriously can't get over how gorgeous this bridal party is. It really makes such a difference when the entire party has professionally done hair and makeup. The overall look is cohesive and simply lovely. Thanks for lettings us be a part of your big day Ashley! What a treat to see these beautiful images from Miranda Marrs Photography and highlight film from Mnemonic Films of Bianca and Michael's wedding this past Fall! The hair and makeup services for this wedding were executed by some of our senior artists including Jamie and Marta. Her tousled half up hairstyle with a little added braid detail and "subtle glam" makeup (soft eyes with dramatic lashes!) is the perfect complement to her blingy fit n flare dress! See more images from the wedding at the Miranda Marrs Photography blog! Big shoutout to the vendor dream team that helped to pull off this amazing day. Planner Julie Blakey with Refined Romance, Perkins Chapel at SMU, The Windsor at Hebron Park, Miranda Marrs Photography, CN Catering, Fancy Cakes by Lauren, Fleurs Dallas, Le Force Entertainment, Blue Diamond Limousines and Love Notes Weddings! Check out the highlight film from Mnemonic Films below! Styled Shoot Behind the Scenes SNEAK PEAK! I am DYING to share images from a seriously dreamy styled shoot we recently worked on with Kari Ellen Events at one of our favorite venues, Avalon Legacy Ranch! But, alas, as styled shoots go we must wait to hear back about publication before sharing the images. Sigh. Stay tuned for more, hopefully soon! 2017 Pick! TheKnot Best of Weddings! We are thrilled to announce that Erin Blair Makeup & Hair Design has been selected as a 2017 winner in The Knot Best of Weddings, an award representing the highest-rated wedding professionals as reviewed by real couples, their families and weddings guests on The Knot, the leading wedding brand and marketplace. Thank you to all of our wonderful clients who took the time to leave us their genuine, heartfelt reviews that enabled us to receive this award for the fourth year running! One of our recent brides was featured on the Ivy Weddings blog ! Christina was a beautiful bride, with extremely curly hair! Our senior artist Melissa went above and beyond to create this smooth curled hair style inspired by Julianne Hough! 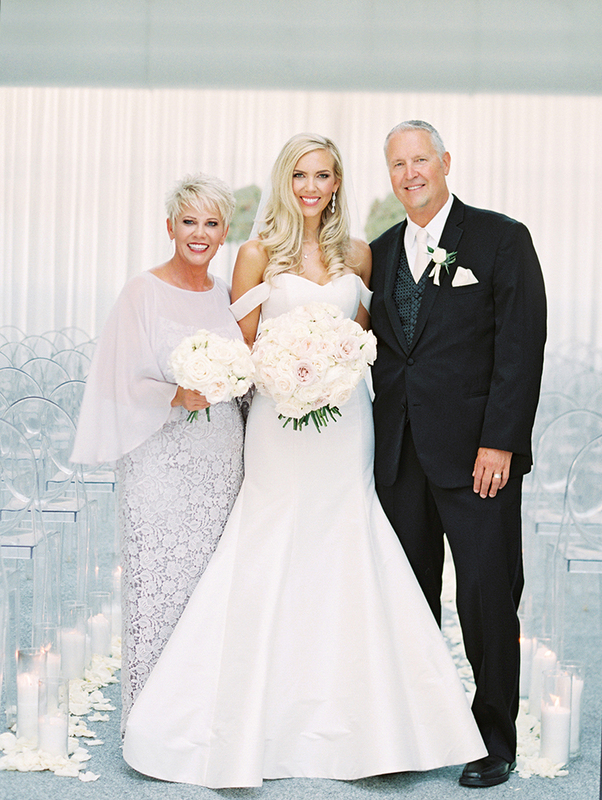 Paired with clean, polished makeup and a knockout ball gown, the result was a look that was both timeless and glamorous. You can see the full blog post here! Thanks for lettings us be a part of your special day, Christina! The summer can be an ideal time for a wedding. The flowers are blooming, the sun is shining, and it’s the perfect time for a vacation! However, the summer heat comes with its own set of problems when it comes to your wedding hair style. But not to worry! We have over a decade of bridal hair styling experience under our belts to help you tread the line between beautiful and practical with these five gorgeous summer wedding hairstyle ideas. Hair style trends right now are largely about showing off fabulous texture that’s wavy, piecey, soft and moveable. 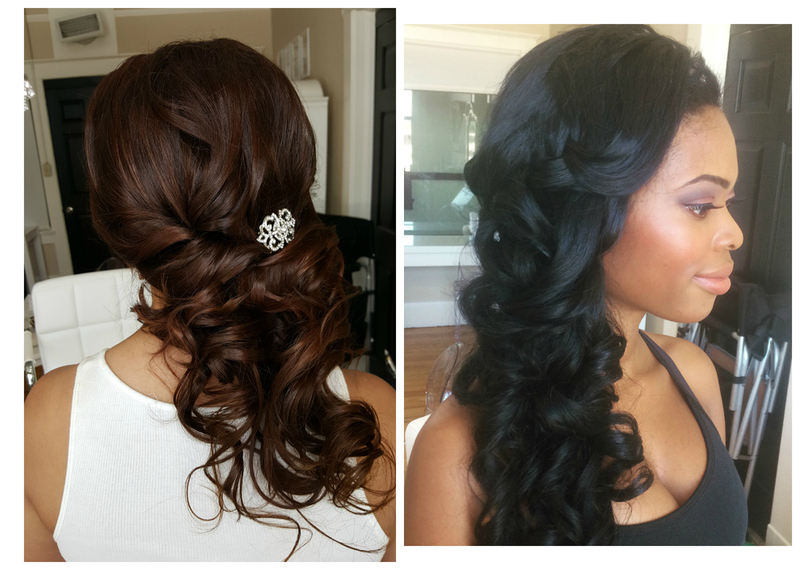 These updos feature that must-have texture throughout the hair, finished off with loosely pinned textured curls. This updo can be set off to the side or centered, looks great with a variety of accessories and veils, and also works great if you want to incorporate a fun braid or twist detail. The textured hair will hold up well in heat and humidity, and pinning the hair off of your neck will keep you cool and looking picture perfect for hours after your “I Dos”. A variation on the Textured, Curled Updo, these hairstyles have all the same benefits while featuring interesting twists and criss-cross features for a look that’s both simple and modern. This look works great as a simple twisted bun, or also as a modern take on the classic French twist! Pinned curl updos have been around since the invention of the hair pin, but today’s take on this classic style has soft, bouncy curls, interesting twists and loops, touchable piece-y texture and often loose strands for that perfectly “undone” look. Subtle variations of this style allow it to be appropriate for any event, from a barefoot beach wedding to a black tie ballroom affair. So you understand that an updo is the more practical choice in the summer, but you LOVE your gorgeous long hair and want to show it off. Consider instead gathering your curls into a tousled “V” shape. This style works amazingly well with strapless and plunging back gowns, can be done with either curly or wavy hair, hair combs, individual sprigs of flowers or hair vines, and it’s also a fun style to incorporate a braid into! Your hair will be securely pinned in place while still being down around your shoulders the way you love it. It’s the perfect happy medium. Best for: Long hair with long layers, normal-thick in texture. Another way to wear your hair down, while still having it pinned securely in place, is the “side swept meets side pony” style. This style is more “down” than a pony, yet has more interest than a simple side sweep. Once hair is curled, pulling back a few strategic pieces into interesting loops, twists or braids will keep it secure off your face and neck, while still showing off your gorgeous long locks.